Wales will be hit by bigger NHS cuts than the rest of the UK, according to a leading health think tank's economist. Writing for the British Medical Journal (BMJ), John Appleby, chief economist at the King's Fund, said the NHS in Wales is set for a budget cut of nearly 11% over three years. Mr Appleby claims England will escape the worst cuts across the four nations. 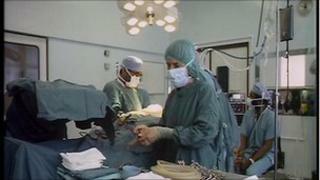 The Welsh Government said the budget was "challenging" but health was still its largest spending area. "We will continue to invest more than 40% of our budget - the Welsh Government's largest single budget - in health and social services," said a spokesperson. Mr Appleby, in his article for the BMJ website, said: "In much of the discussion and debate about health care spending and reform, the "N" in NHS seems often to stand for England, yet around 10m people in the UK do not live in England or use its health care services". The news that the Welsh NHS is to suffer larger cuts than other parts of the UK isn't a great surprise. The row over whether or not to ring fence health spending in Wales raged through the recent election. But the figures calculated by the King's Fund do give an independent view on how deep the cut will be in comparison to other nations. They also set out very clearly the challenge facing the new Health Minister, Lesley Griffiths. She knows that real cutbacks now have to be made. There's only so much that can be achieved by efficiency drives - wards will have to close, posts may have to close if the Welsh NHS is to live within its given budget. Few difficult decisions like this were made ahead of May's election - but now, the health boards will have to make the unpopular choices which have been put off for years. "Given the political arguments about whether the NHS budget has received a real increase in funding over the next four years as the government claims, it is important to be clear about which NHS is being protected," he added. "NHS spending in England dominates UK spending of course, with spending in London equivalent to the combined budgets of Scotland and Wales," said Mr Appleby. But he pointed out that, traditionally, spending per head in England has been lower than in all other parts of the UK. Despite the challenging current settlement, the health and social services budget was "fair and manageable" within the funding constraints from the UK government, said the Welsh Government. A spokesperson added: "We have also recently announced a further £65m over the next three years to drive down waiting times for orthopaedic services. This additional funding will not have been taken into account in this estimate. "Over the next year, we are maintaining the health budget in cash terms to protect the vital services that people rely on. We plan to maintain revenue funding, the money that goes directly towards supporting frontline services, at around current levels beyond this." The spokesperson said health spending was just one piece of the jigsaw, pointing to investment in social services and housing. "The difficult decisions that we have made and the proactive approach we have taken in the health service mean that we can look at these issues across the board," they added.